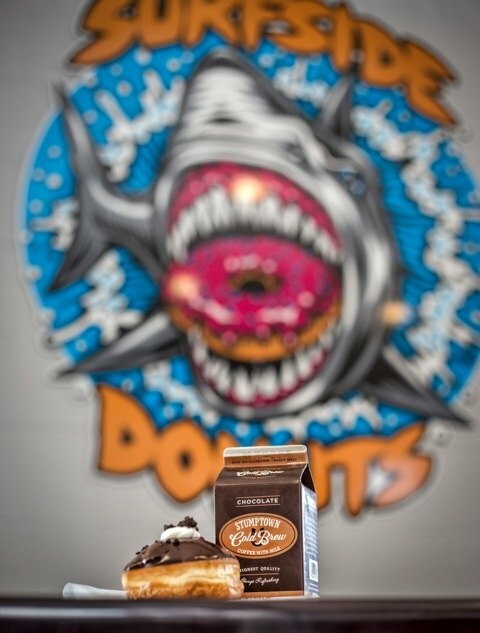 Surfside Donuts was founded...well because downtown Pismo Beach needed a good donut shop. It was the one thing our town was severely lacking. Having good donuts and coffee by the beach is mandatory in our opinion. We are located in the heart of downtown Pismo at 603 Dolliver and we even have our own parking lot, which is rare in our little beach town, so you'll always have a place to park. We make our donuts fresh every morning and our menu changes daily. We make some of the old standby donuts and some fancier more exotic donuts. Our Strawberry Clam Shell donut is our signature donut offered during Spring and Summer (strawberry season). Other popular donuts we offer are Maple Bacon, Salted Caramel and our very own crumb donut we call The Dirt Surf. We're on Snapchat, Instagram & FaceBook!